Here Sensei would write something. My training started in late 1995 at Master Glazier Karate Center located in Whtiehall. I started under instructor Sensei Sam Esposito at the age of 10. Sensei Sam taught me a lot. He taught me how to defend myself, gave me confidence in myself, and helped me believe I could do anything that I set my mind to. Sensei Sam then opened up his own karate school, called Competitive Edge Karate in the summer of 1999. I followed him to the new location because I knew that I would be going places if I stuck with him. 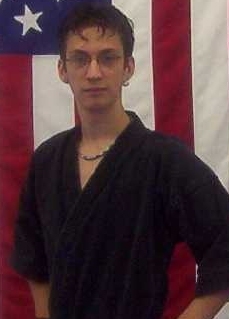 In the fall of 2000 I tested for my black belt and passed. I was on top of the world, and I thought nothing was going to knock me off, and stop me from training. However in the spring of 2002, Competitive Edge Karate closed, and Sensei Sam was gone,... but he didn't give up and neither did I. Sensei Sam immediately began construction on his new karate school. After it was completed, I was contacted by him and the next day I was back, and ready to train at the new location. July 16th, 2002 was the day that Sensei Sam's new school opened. It was named Team United Karate, and I was right there with him. Not only did he help me continue my training, he taught me some very important lessons about the business world and how to run a business. It is now July 19, 2003 and I am 17, we are still here and with his help and my dedication to become the best that I can be, he helped me get through one of the toughest challenges I have ever had, and that was my second degree black belt test. With the passing of my test, Sensei Sam promoted me to Deshi. I am honored to know that I am one of a select few to have that title. We're still kicking and training and we're not leaving any time soon. I am glad, and honored to be a part of Sensei Sam and his dream of having a school to pass down to, and I will do my best not to let him down. Please stop by to introduce yourself to the new students and offer your encouragement as they begin their karate journey. What is Flexibility Day? Why should I attend? Flexibility day is open to all students and provides you with an opportunity to improve your range of motion, primarily in kicking. By stretching muscles, you will improve not only how high you can kick, but by decreasing the resistance of opposing muscles, your kicking speed will improve, too. Flexibility Day provides students a chance to perform both individual and partner stretching. 1. Warm up first. Warm muscles are less likely to be damaged then cold ones. 2. Stretch slowly and continuously, don't bounce! Bouncing can tear and damage muscle fiber. 3. Relax and breath during the stretch. 4. Do not go home and practice your high kicks! When you are very stretched out after class, you can damage the muscles more easily. 5. If you find that you're sore the next day, keep moving! Reminder - please leave shoes in the waiting area, out of the way of other students. This will keep the training mats clean and the walkways safe! Thank you for your cooperation! Reminder- for your convenience, the latest calendar events and class times will be posted on the school's web page.